The festive season can fill the workplace with a flurry of excitement. 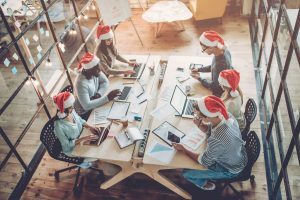 Tinsel adorned desks, office Christmas parties and Secret Santa gifts can soften the scrooges amongst us and boost employee morale. On the flip-side it can equate to a productivity meltdown, as the focus is on a Christmas countdown rather than a financially rewarding end-of-year performance. So what can be done to ensure you and your staff ‘have yourself a productive Christmas’? The answer lies with Performance Appraisal Software! You may well have read our early blog entitled: ‘Year-round performance appraisal – how do we actually make it happen?’. In this blog we outlined the importance of ditching the performance appraisal for organic, meaningful and more effective conversations. Managers should have been holding regular one to one’s with their staff throughout the year, facilitated by an effective Performance Appraisal Software such as Actus. Whether or not December is the end of your financial year, staff should have clarity on whether they are on track for meeting SMART objectives set at the start of the year. By using a performance appraisal system to set regular milestones, staff should have complete clarity of objectives and responsibilities to be met; and can remain focused even during the festive period. A good system will also help Managers and their staff to start planning for the year ahead, so that on returning to the office in January, staff know what is expected and will feel supported. Staff that demonstrate a Christmas Performance worth applauding should also be recognised for their hard work and this can be shown, not just by throwing an elaborate Christmas party but via simple recognition that acknowledges a job well done. The gift of recognition can be given using a simple appraisal software tool like Actus, which allows for manager and peer recognition at the click of a button. As we look to the New Year, you will likely be wondering how 2019 can be better than the year just gone. Investing in an effective performance appraisal software is one step your business can take to support your staff and improve employee engagement and productivity for the year ahead. For more information on building the business case for such a solution, take a look at our blog series by clicking on the button below or request a free demo to see the Actus System for yourself!